Download version 2.1.0 released on 02.07.2016. This requires at least Windows 7 SP1. For an operating system before Windows 8, if you aren't current with all the updates, you might have to first install Microsoft's .Net 4.5 from here. To run the program, unzip the downloaded file where you want, and run the executable file. There are two programs included in the archive: Noisette is geared toward generating sounds and can play a single sound at a time, NoisetteX allows you to play simultaneously several sound files or playlists. You should use lengthy sound files or else you will hear interruptions when the playing starts again. Noisette is a program which continuously plays white noise. It's useful for people who live or work in a noisy place, people who want to cover the stressful background noise. "White noise" refers to a specific type of sound, but is also used as a generic term for noises which sound like static / hissing, huge waterfalls or heavy rain. White noise is very effective in providing a wall of sound against environmental noise, but can't cover loud noises like the music from neighbors. Theoretically, it might cover them, but it would have to be so loud that it would itself be the problem. Grueling sounds, like the "Hard sledge hammer" sound generated by Noisette, can even cover a neighbor's subwoofer, but they create their own (severe) problems. 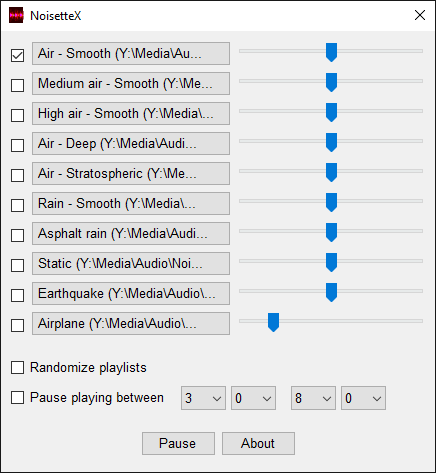 Audio files and computer software are a very good way to generate white noise due to the the diversity of the sounds, diversity of the speakers and the wider volume control (including with remote controls). Use two standalone speakers. Notebook, tablet or phone speakers are no good. Standalone speakers can give a lot of power to the low frequencies, which makes the noises sound "deeper"; however, a subwoofer would create annoyingly powerful low frequencies. A white noise machine is a cheap and portable solution, but its noise is very localized (because its speaker is small). White noise machines might be acceptable if several of them are used at the same time, in different places of a room, in order to fill the room with noise. A fan in a large box (like a desktop computer, air conditioner or air purifier) makes the box resonate, so the sound appears to come from all around, and this means that, even at a low volume, its sound can cover more environmental noise than a small speaker. Think at the difference between a mosquito and a refrigerator; they have about the same sound intensity, but feel vastly different. Fans and air conditioners are not practical because they consume a lot of electricity and generate drafts. Air purifiers might be a good solution because: the used energy is small, the air draft is small (the lower the used speed is), and most importantly, its entire body resonates together with the fan, which makes its sound fill the room even at a low noise intensity. Things to look for in an air purifier: multiple speeds (preferably 5), the lowest noise intensity below 30 dB, an energy use below 20 W for the lowest speed, a night mode. An air purifier is not necessarily meant to remove dust from the air, but only certain small particles. Make sure to read the reviews that mention an unpleasant smell. When calculating the total cost of the solution you intend to use, consider that speakers need a computer to play the noise file. It may surprise you to hear that grueling sounds, like "Hard sledge hammer", can calm a hyperactive brain. This happens because such sounds disrupts the brain's activity, including hyperactivity. But since the cause of the hyperactivity doesn't disappear, the calm is temporary. Be aware that the side effects are quite strong on both brain activity and ear, so limit the use of such sounds. If you have problems with noisy neighbors, read this. For more features read History of changes. Here are some white noise sound files, each with a 5'000 seconds duration: Air - Smooth (Air: hp 100hz-48db, lp 15'000hz-48db), Medium air - Smooth (Medium air: hp 100hz-48db, lp 15'000hz-48db), High air - Smooth (High air: hp 100hz-48db, lp 15'000hz-48db), Air - Deep (Air: hp 100hz-48db lp 2000hz-48db), Air - Stratospheric (Air: hp 100hz-48db lp 400hz-48db), Rain - Smooth (Rain: hp 100hz-48db, lp 15'000hz-48db), Static; right-click a link and choose "Save target / link as" in order to save each file on your computer. When you click on a link, modern browsers start streaming the noise, so that you can see which ones you like. You can play them with NoisetteX or any sound player. "Air" is, technically, a type of brown noise, but unlike brown noise, it doesn't exhibit high frequency fluttering, that is, it's a much smoother noise, especially at high volumes. Some noises are derived from the original, by applying effects (indicated in parenthesis) in Audacity, as follows: "hp" - high pass filter, "lp" - low pass filter, "hz" – frequency (= threshold above / below which to preserve frequencies), "db" – rolloff (= volume reduction of low / high frequencies), "g" – gain (= volume increase of remaining frequencies). A high pass filter removes subtle patterns within low frequencies. A low pass filter can create sounds with low frequencies which sound like a deep rumble, even if the original sound is just static. Here you can see a number of sound files and videoclips with various relaxation sounds. If you want relaxation, also look there for ASMR. Noisette and NoisetteX can be controlled with a Windows Media Center remote control. The "Play", "Pause / Resume", "Stop", "OK", "Enter", "Space" keys stop or toggle playing. The "0"..."9" keys play the sound with the specified index ("0" is for 10). Reactive noise allows the program to play a sound only when there is noise in the environment. If there is noise in the environment, the program plays the currently selected sound. If the noise in the environment stops, the program stops playing the currently selected sound. 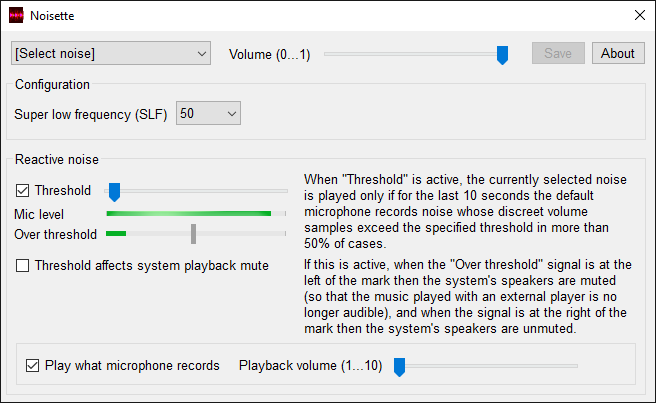 In the main window of the program, when the "Threshold" check-box is active, the currently selected sound is played only if for the last 10 seconds the default microphone connected to the computer records environmental noise whose discreet volume samples exceed the specified threshold in more than 50% of cases. This 10-50 rule ensures that the program will start playing a sound only when there is a sustained noise in the environment, not when there is a sudden, short noise. When the "Play what microphone records" check-box is active, the program will also play what it records through the computer's microphone. The microphone integrated in a notebook or tablet is perfectly usable for this feature. You can use Audacity to edit sound files, and save them as MP3s (that you can play on an external player). When you want to repeat a sound file by appending it to itself, after you copy and paste the file to itself use the "Effect \ Repair" menu function (on the join area) to remove any click noises which may have occurred (at the join). If you want to make a noise sound less stereo and more mono (that is, sound less in-your-ears), use the "Stereo butterfly" Nyquist filter (you first have to import it from the website). SPL is the local pressure deviation from the atmospheric pressure, caused by a sound wave. SPL represents an important factor in comparing the "power" of speakers, especially of subwoofers. The higher the SPL is, the more powerful a speaker sounds. The SPL written in the specifications of speakers is normally measured at 1 m away. An SPL of about 130 creates a sound shock wave powerful enough to be felt as a hit in the chest, but there have to be about 140 to feel the chest pounding. A jet engine has an SPL of 150 dB, a vuvuzele horn has 120 dB, jack hammer 100 dB, refrigerator 40 dB. The dB scale is logarithmic, so 10 dB represents a doubling of the perceived sound volume / loudness. A 10 dB increase of the SPL means that the sound amplifier needs 10 times more power (electrical, not RMS). Doubling the distance decreases the SPL (and the perceived sound volume / loudness) with 6 dB. In order to get low frequency sounds to sound as intense as high frequency sounds, dedicated speakers (like subwoofers) must be used because normal speakers can't produce low frequency sounds with a high intensity. To decide whether to get a ported or sealed subwoofer, see this. It's possible to run the program on tablets which have full Windows. However, by default, Windows on tablets uses a sleep mode called "connected standby", mode which once active stops all desktop applications (but not the ModernUI ones). Because of this, network downloads stop, instant messengers don't receive messages, email clients don't check for new mail, sound stops, and so on. In this mode, if the tablet's display is turned off, the connected standby mode is activated, that is, there is no separation between the display and the sleep mode. In order to deactivate the connected standby and keep the desktop applications running when the display turns off, you have change something in the tablet's registry. Go to the "HKEY_LOCAL_MACHINE \ System \ CurrentControlSet \ Control \ Power \ CSEnabled" key and set its value to 0 (from its default value of 1). Then restart the computer. Then, in the current power plan set the time after which the display is turned off. Note that once the connected standby mode is deactivated, the tablet can no longer sleep, though it can hibernate, so even if the display is turned off, the tablet will consume a lot more energy than with the connected standby mode active. Sometimes you may hear a faint pattern in the noise. Some patterns may be present in noise itself, but some appear only from time to time. If this happens, it's most likely that you have to reboot your computer. Phones are the worst in this regard. If rebooting doesn't fix this issue, try to restart your speakers as well (the amplifier integrated in your speakers might introduce patterns); also try to shutdown and then start your computer and speakers. Also check the sockets and transformers because some may be whistling, and unplug anything from the sockets, and unplug the transformers from the sockets. Make sure you disable any effects from speakers themselves and from software, like bass booster. Added an option to automatically mute and unmute the system's speakers when the environmental noise (recorded by the microphone) is below / over the threshold specified by the reactive noise feature. This is useful when playing music with an external player and you want the sound to be affected by the reactive noise. Added volume for the microphone playback. The super low frequency is used by more noises. Added the "Medium Air" and "High Air" noises. Added the ability to save noises up to 50'000 seconds. Added new noises and improved the old ones. Bug fix: If the configuration file is invalid, the application might not start and no error message is shown. Added the ability to save noises. Bug fix: The loaded noise files were not affected by the reactive noise. The sound files (only ".wav") from the "Sounds" directory from the program's directory are loaded in the list of available noises. Most noise are generated, not loaded from a file. First public release of Noisette: version 1 on 19 January 2008.